Connect a mic and headphones for a simple broadcast back to the station. Already at the station? Use Broadcast Host in your newsroom to record high quality interviews. Broadcast Host allows you to send mic and line level signals into the phone line while maintaining excellent separation between your voice and the caller. The stereo output jack on the back of the unit provides your voice on one channel and only the caller's voice on the other channel. The balanced XLR output jack contains only the caller's voice. 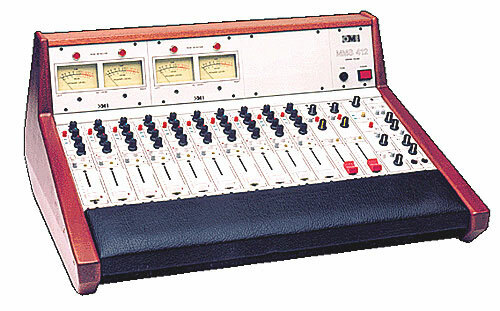 Broadcast Host provides connections for a microphone, headphones, mixer, sound card, telephone and your analog telephone line. An auxiliary telephone is only required to place outgoing calls. The auxiliary telephone is disconnected when you press the "Call" button, and reconnected when you press the "Drop" button. 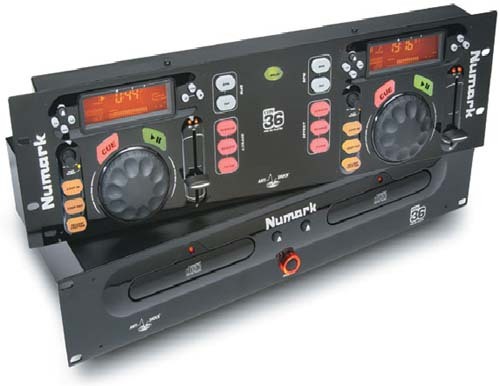 Numark Industries proudly presents the CDN-36 Anti-Shock Dual CD player. This professional dual CD player is designed with the finest components to deliver non-stop music under virtually any conditions. It includes fader start, relay play, automatic door closure, with analog and digital outputs. The CDN-36 is considered the most reliable dual CD player on the market offering full-buffered anti-shock memory, seamless looping, seamless stuttering, and a BPM counter. Basic features of the CDN-36 are auto dead space elimination, +8/16 percent pitch bend/jog wheel, sleep mode, infinite full CD continuous play, +8/16 percent pitch adjust, +10 track advance, and the track sequence program mode found on all Numark CD players. The unit also features a sizeable back-lit display showing modes for current play status, track remain, elapsed or full CD remain time with track number, minutes, seconds, and frames; a time progress bar; program status; BPM counter; single or continuous play; and pitch change percentage. Includes our exclusive 30-day money back guarantee and one year warranty. The CDN90 is Numark's most advanced dual CD player ever. Starting with a control module encased in a super-rigid aluminum extrusion, the CDN90 delivers bombproof construction for mobile professionals, studio and club installations, and any other applications that call for "The Best." The CDN90 builds on our renowned line of dual CD players with integrating real time scratching, multiple simultaneous effects, MIDI in/out for unprecedented creativity and control, user updateable firmware, and digital output. Features: Real time scratching, Built-in Beatkeeper with auto-mixing and synchronization, Multiple DSP effects with direct access including reverse, Saves up to 3,000 cue points in memory, transferable to compatible units, ±6, 12, 25 and 100% pitch control, ±100% KEY LOCK with key control, 2 complete seamless loops with 3 hot stutter starts, High speed rotary track access with sequence programming, Adjustable startup and braking speeds, S/PDIF coax digital outputs, MIDI in/out, CDR compatible, Fader/remote start and relay, 48 seconds of buffer memory for Anti-Shock, Transport bay illumination light, all-rubber buttons, User-upgradeable; sleep mode to extend laser life. Simply the best! 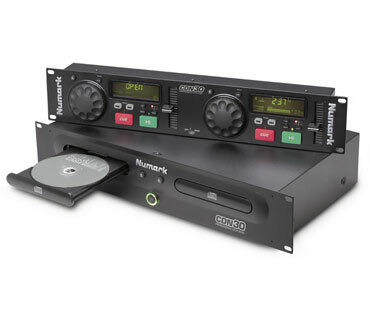 Numark Industries proudly presents the brand new CDN-30 Anti-Shock Dual CD player. This unit is CDR compatible and was designed with the same NUMARK exclusive and already proven reliable anti-shock buffer memory technology. The CDN-30 never stops the music with 12 seconds of anti-shock buffered memory. 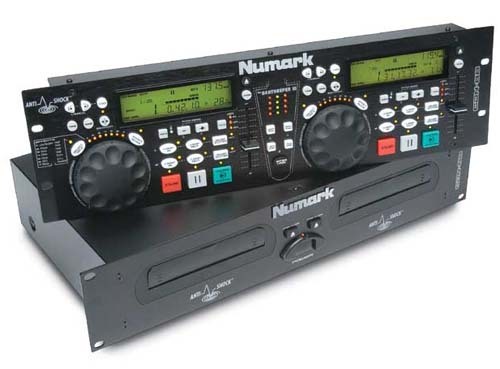 This 2 rack-space unit incorporates true instant start along with a 8/16% pitch wheel, analog and digital outputs, auto-dead space elimination, full CD infinite play, Three Speed Forward/Reverse Scanning Wheel, +/-16% pitch adjust, +10 track advance, and the track sequence program mode found on all Numark CD players. The unit also features an enormous back lighted display showing modes for current play status; track remain, elapsed or full CD remain time with track number, minutes, seconds and frames; a time progress bar; program status; single or continuous play; and pitch change percentage. Includes our exclusive 30-day money back guarantee and manufacturer's full one year warranty. Imagine doing everything you can do on vinyl, but in your CD player. The CDN-88 provides real time scratching with true vinyl sound and feel. Capabilities such as +/-100% pitch change and Key Lock (a.k.a. master tempo), reverse play, dual loops, Antishock?, and sound processing give you the technology to be as creative as you want. A built in Beatkeeper? with Interlock? function can align all cue points, make perfect loops, and, if you choose, automatically lock both players together on the beat. Now you can do anything you want with your music. Includes our 30-day money back guarantee and one year waranty. Pick up this new handheld road tool to get audio in an out of analog phone lines, PBX systems, even cell phones. Perfect for Remote Broadcasts, IFB feeds, or interviews over any phone connection. Cell Phones: Simply plug ComPack into the 2.5 mm headset jack of your wireless cell phone. Your phone will recognize ComPack as a headset which will disable the mic and speaker in the phone. PBX Systems: Unplug the handset from any analog or digital PBX phone and plug the coily cord into ComPack. You can now send and receive audio through the PBX telephone set. 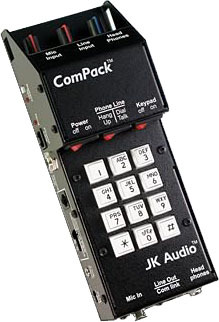 ComPack also functions as a simple telecom interface for your beltpack intercom system. This no-frills feature allows you to connect the 3 pin male XLR to your beltpack intercom group. This provides a full duplex, always-on connection to any telephone network. The ComPack cell phone interface was designed to take advantage of the increasing number of wireless phones that accept third party headsets and earpiece headsets. While some wireless phones have the 2.5 mm jack directly on the phone, others require a headset adapter which converts their proprietary connector into this 2.5mm jack. The DUALFEX PRO EX2200 has been developed out of many years of research and development in the field of psychoacoustic processing. It improves presence, transparency, and intelligibility and will improve and widen the spatial image even beyond the speakers! No special decoder or receiver is required which makes this the perfect processor for FM stereo broadcasting. The newly re-designed DUALFEX PRO EX2200 sets new standards in affordable psychoacoustic processing, adding fantastic new dimensions to your sound. The net result is a subjective "loudening" of the audio signal in a manner not achievable by simply applying high and low end boost via an equalizer. Your mixes will sound louder, wider, bigger, brighter and clearer, with fuller, firmer and far better defined bass end. The DUALFEX PRO improves presence, transparency, and intelligibility and it provides sharper stereo imaging with more powerful, warmer, "tube-like" bass. Provides a louder, cleaner sound that makes you stand out from the crowd. Includes our exclusive 30 day money back guarantee & 2 year warranty. The "GEQ3102" stereo frequency equalizer is a dual 31-band (1/3 Octave) equalizer, with individual 12dB boost/cut level slide controls for each channel and for each band. With the GEQ3102 you can control the frequency response of your entire music system to complement any size listening area. Includes tape monitor loop inputs and convenient defeat switches for each channel. This valuable, cost effective tool can be used by disc jockeys, musicians, performers and sound contractors, as well as discriminating home stereo users. Includes our exclusive 30-day money back guarantee and manufacturer's full 1 year warranty. 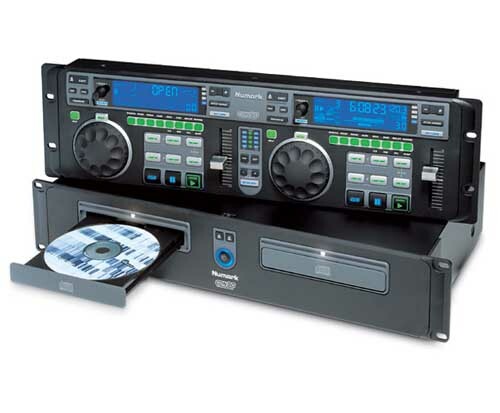 ULTRAGRAPH DIGITAL DEQ1024 is an ultra high-resolution digital stereo 31-band equalizer feedback destroyer. It combines unmatched digital performance with straightforward and intuitive analog-like operation. The revolutionary FBQ Feedback Detection System instantly detects critical feedback frequencies and can also be used as an audio analyzer, making the DEQ1024 a must-have for every professional touring rack. Switching on the automatic Feedback Destroyer removes feedback within a fraction of a second. A state-of-the-art 24/48-bit DSP and ultra high-resolution 24-bit/96 kHz A/D and D/A converters deliver the ultimate in sonic resolution. The EQ section features three selectable operating ranges (±12 dB, ±6 dB and 0/-24 dB) and 31 high-quality illuminated 45-mm faders. The switchable TRUE CURVE function precisely translates fader positions into an exact What-You-See-Is-What-You-Get frequency response. In addition, the DEQ1024 features sweepable low cut and high cut filters, an inaudible Noise Gate/Peak Limiter and Pink Noise generator plus stereo imager that provides unbelievable spatial enhancement and improved stereo imaging. A digital AES/EBU and S/PDIF interface gives you ample connection flexibility and lets you select between three sample rates (44.1, 48 and 96 kHz). The DEQ1024 features both servo balanced inputs and outputs with gold-plated XLR and 1 TRS connectors. The built-in switch-mode power supply can operate world-wide (100 - 240 V~), ensuring noise-free audio, superior transient response and lowest possible power consumption. In short, you get top-notch performance, analog feel, ease of use and abundant connectivity options, all of which make the DEQ1024 an ideal tool for both live and studio applications. The flagship of the entire FBQ series, the ULTRAGRAPH PRO FBQ6200 is an ultra-musical 31-band stereo graphic equalizer that goes the distance to offer a maximum in performance and flexibility in both live and studio applications. Start with the forward-looking, patent-pending FBQ Feedback Detection System that instantly reveals feedback frequencies and also can be used as an audio analyzer. A whole battery of superb features makes the FBQ6200 score high on the ease-of-use scale: dedicated limiters with gain reduction meters for each channel protect your sound system from overload and distortion, and a pink noise generator provides test signals for equalizing your sound system to any room acoustics. A mono subwoofer output with dedicated level control and adjustable crossover frequency gives your music some extra verve. Expect reliability in the long run with the high-quality illuminated 45-mm faders, detent ALPS® potentiometers and illuminated switches. Any way you look at it, the FBQ6200 has all the right stuff to become a welcome addition to your equipment rack. Here is the quickest, easiest, and most convenient method of connecting a telephone line to your mixing board. The HC-1 connects in series with the handset of any telephone using the existing modular connectors. No direct connection to the phone line is needed. Press the front panel button and external audio is available on separate send and receive 1/4" TRS (Tip, Ring, & Sleeve) jacks located on the rear panel of the HC-1. Release the button and the handset is connected through for normal use of the telephone. Nothing could be simpler! The unit is passive, so no external power is required. You can find many uses for the HC-1 around your station such as Caller ON-AIR, production room, newsroom, sales office, field news kit, sports remotes, etc. Includes our 30 day money back guarantee and 1 year warranty. The Inline Patch is a little box that connects between the base of an analog or cordless telephone and the wall jack. You can continue to talk on the phone and get access to audio on both sides of the call. The unit's two back-to-back hybrids give you complete control of audio from both sides of the call. Audio input jacks let you mix sound bytes or music into your conversation. One stereo output jack provides your voice on one channel and the caller's voice on the other channel. A second output jack contains a mix of both voices. Front panel control for each output offers all the control you will need. The Inline Patch will not disrupt your Caller ID or ring signals. The MXL-2001P has been designed for the budget minded studio that requires world class large diaphragm condenser sound at an affordable price. Its crisp, open sound lets its presence stay right out in front of the mix, making it an excellent choice for any broadcast application. Its 1" gold sputtered diaphragm is coupled through an electromagnetic screen to an FET preamp with a balanced transformer output. Comes with screw-on mic stand adapter. An optional high isolation shock mount (MXL-56) is available separately. The MXL-2003 is intended for the most critical recording or broadcast applications where tremendous clarity, presence, and detail are required. The MXL-2003 is an outstanding performer in a class with the worlds finest studio mics. Its 1.06" capsule is coupled through an electromagnetic screen to an FET preamp with wideband transformerless balanced output. Includes the MXL-56 high isolation shock mount. Both mics include our exclusive 30-day money back guarantee. NOTE: Either mic can be used with systems that do not have a phantom power supply by using the MXL-PPS power supply below. Equipped with a high energy rare earth Neodymium magnet that provides up to 6 dB of additional range (gain without noise), the new S12 from Samson features a flat, full range frequency response that produces a balanced, natural sound with a highly articulate midrange and smooth upper end. The S12's state-of-the-art dynamic design easily withstands high sound pressure levels (SPLs) greater than 130 dB. Its unidirectional hypercardioid pattern ensures the transmission of a strong clear signal in environments where unwanted ambient sound occurs from many different directions while also reducing feedback. Its low impedance output provides a clear signal on long cable runs. A special gold-plated XLR connector ensures long life and trouble free connections. Lightweight and compact, this exceptional mic can be mounted on any standard microphone stand using the supplied mic clip. Includes 30-day money back guarantee. 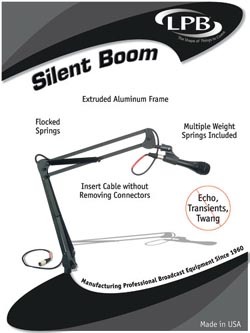 Two section extruded aluminum microphone boom, with light and heavy weight flocked springs for up to 7 pound loads. Includes Delrin insert for desktop mounting. Made in the USA. The ultimate "scratch" mixer offering super professional features and quality at an extremely affordable price. The DX100 features two "dual input" stereo channels equipped with professional 60mm Panasonic faders, 3-Band equalizer on the main outputs; a high-quality cross fader (that lasts over 150,000 cycles) with cut switches plus stereo main and tape outputs. Includes PFL functions on both channels and an extra DJ mic input. Comes with 30 day money back guarantee and one year warranty. The DX1000 mixer leads the way for this new line of "scratch" mixers with five "dual input" stereo channels to maximize available sources. 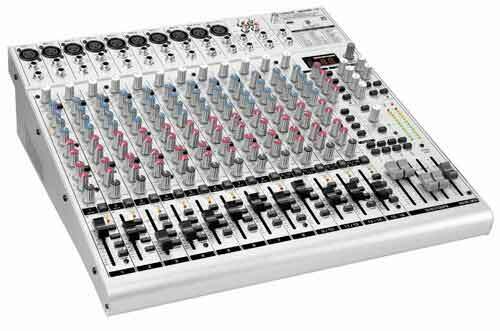 With a front panel layout designed for ease of use, this versatile mixer also includes two dedicated mic channels with the same control scheme as the regular channels using fully professional 100mm faders and an input trim and PFL on each channel. A 3-Band EQ section with "kill" switches that selectively removes either the bass, mids or highs to create new bass lines or "telephone" effects. A high quality cross fader with punch/cut switches offers more dynamic control. An on board Talkover control lets DJs bring in their voice smoothly over the music. Also includes Main, monitor, and zone outputs. Has separate sub-bass output with crossover and level control and remote machine control on all channels. Comes with 30-day money back guarantee & 1 year warranty. 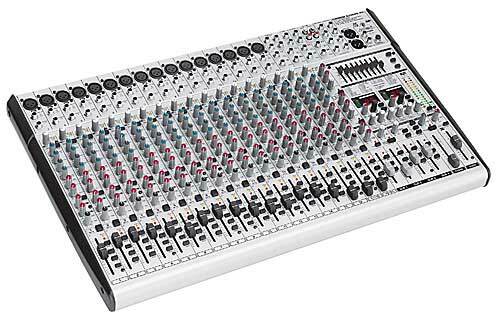 The SL2442FX-PRO is the new compact SL Series mixing console with 24 channels (16 mono plus 4 stereo). 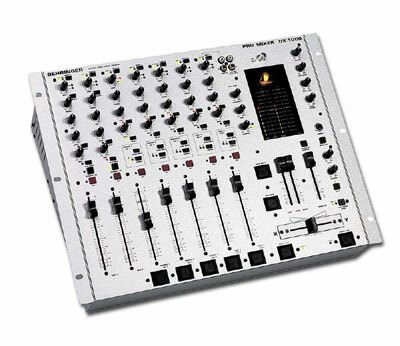 It features 4 subgroups and 2 pre/post switchable and 2 post fader aux sends per channel, 3-band EQs with semi-parametric mids and low cut filters for the mono channels, full-fledged high-headroom stereo input channels with 4-band equalization plus additional stereo input channels with level and pre-fader aux facilities. 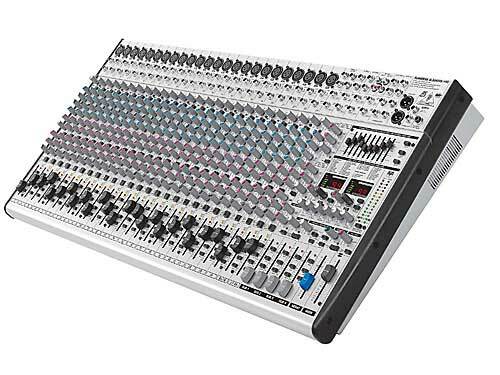 SL3242FX-PRO is the new full size SL Series mixing console with 32 channels (24 mono plus 4 stereo). It features 4 subgroups and 2 pre/post switchable and 2 post fader aux sends per channel, 3-band EQs with semi-parametric mids and low cut filters for the mono channels, full-fledged high-headroom stereo input channels with 4-band equalization plus additional stereo input channels with level and pre-fader aux facilities. This is the big cajuna of the whole UB Series. You get all the features youd expect in an ultra high-quality compact mixer: 16 balanced high-headroom line inputs with dedicated gain controls on stereo channels 13-16, 10 new state-of-the-art, studio-grade IMP Invisible Mic Preamps, and an effective, extremely musical 3-band EQ with semi-parametric mid band plus switchable low-cut filter on all mono channels. There is also an integrated 24-bit digital stereo FX processor with 99 great-sounding VIRTUALIZER presets. Because of their extensive and carefully thought-out routing possibilities, these consoles lend themselves equally to both live and studio use. The prime suspects are high-quality recording studios as well as MIDI-studio applications, small-size PA applications and FM broadcasters (solo entertainers, duos to quartets, small bands), video edits and similar setups. Includes 30-day money back guarantee and 1 year warranty. 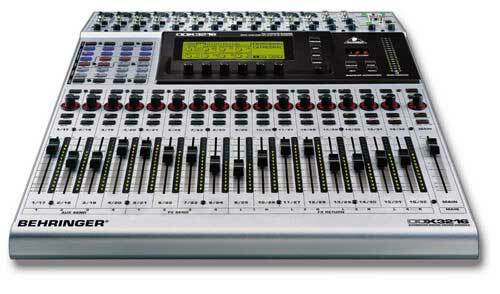 The MMS-412 audio mixers are designed exclusively for small radio broadcast studios. Their ten by two inputs, two output masters, and two telephone hybrids make them indispensable boards for any small radio station. The two output masters allow you to perform On-Air and Recording functions simultaneously. The two telephone hybrids also allow you to speak on and off the air simultaneously. The MMS-412 can access up to 20 inputs. Includes master output EQ and a full one year warranty. Our first digital console offers a feature set you wont find in any other product in its class. In fact, you wont find some of the DDX3216s features in any compact digital console. Start with its 32 channels, 16 internal busses and 8 aux sends. Each channel features a fully parametric 4-band equalizer, sweepable high-pass filter, gate, compressor/limiter and phase inversionall simultaneously operable. The first 16 channels additionally offer a delay function. Add four on-board effects processors that put just about any imaginable effect type at your fingertips, naturally in top quality and also simultaneously accessible. Then full-fledged dynamic and static automation functions, extensive synchronization options and MIDI implementation, a comprehensive internal I/O patchbay, full digital compatibility and functionality. Plus unusually flexible connectivity and expandability, supported via two expansion slots for ADAT ® , TDIF, AES/EBU interfaces and more. All based on 32-bit floating-point processing (40-bit for the EQs). The new surround update transforms the DDX3216 into a full-fledged surround mixer with extensive control possibilities. Surround-specific settings such as divergence, angle and listener-source distance can be adjusted, you can implement circular movement through the room, and you can record your sound mix using internal automation. In surround mode busses 11 through 16 represent the 6 surround channels, giving you a true 5.1 mix. Besides you can alternate between the standard stereo and 5.1 surround mix or you can use the both at the same time. Includes 30-day money back guarantee and 1 year warranty. 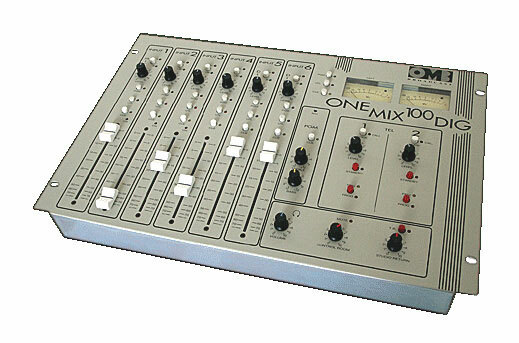 The ONE MIX audio mixers are designed exclusively for small radio broadcast studios. Their six by two inputs, two output masters, and two telephone hybrids make them indispensable boards for any small radio station. The two output masters allow you to perform On-Air and Recording functions simultaneously. The two telephone hybrids also allow you to speak on and off the air simultaneously. The One-Mix can access up to 12 inputs, the MMS-412 up to 20 inputs. Both have master output EQ and include a full one year warranty. The 340 series warning lights (formerly from the well known Fidelipac) are the industry standard lights used in broadcast and recording studios nationwide. 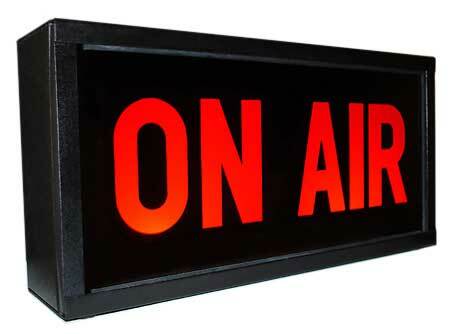 Available with "ON AIR" or "RECORDING" this lightweight sign sits handsomely on any shelf or tabletop, or can be wall mounted. Aside from broadcast or recording applications, it makes a great gift, conversation piece, or novelty item. It can even be used as a decorative item for the home, office, or the bar! Dimensions are: 5" H x 10" W x 2.5" D. Operates from 120 volt AC with a simple contact closure. Comes with our exclusive 30-day money-back guarantee & one year warranty. The DSP9024 uses 6-way multiband digital processing circuitry which eliminates any intermodulation distortion or "pumping" so you get absolute dynamic control with none of the annoying side-effects. The frequency range for each band of processing is fully adjustable. You can also apply parameter editing like Threshold and Ratio to each band individually or to all six bands simultaneously. Includes Behringer's exclusive Interactive Gain Control (IGC) circuitry, peak limiters, and Interactive Ratio Control (IRC). Also features a six-band tube emulator and harmonic exciter which allows you to warm up your bass and clean up the high end. Comes with our exclusive 30-day money back guarantee & manufacturer's 2 year warranty! The DSP X is a new generation of digital audio signal processor that can be used for FM, NET and Digital radio broadcasting. The DSP X is the first UK designed and manufactured digital multi-band broadcast processor. Using the latest multiband DSP technology the DSP X offers a versatile and powerful tool in creating a loud punchy on-air presence. The DSP X has been designed and built from scratch using a new approach to the design of a digital audio processor that incorporates the most up to date components. Cutting edge technologies allow the DSP X to produce similar results to other processors in the market but in a simpler more cost effective way. The advances we have made have allowed us to pass the savings on to our customers. The DSP X is driven by a fast 8 bit micro-controller which controls a vast array of specialised analog and digital circuits: These include 24-bit A/D and D/A convertors, analogue level control circuitry, 18 x 24 bit DSP's, an ethernet port, a trigger port, 2 x RS232 ports, 200 LEDS (metering), an LCD screen, 2 sample rate convertors, a headphone jack and memory devices to hold the software and firmware. After input selection the 24-bit digital audio signal is passed through a wideband AGC processing block to normalize input levels. The output of the AGC feeds the EQ and audio shaping sections before being split into four bands by linear phase time aligned filters. The four bands are processed by a further four AGC'S before being fed to dynamic audio limiters on each band. Look ahead limiting and distortion cancelling clipping ensure your signal is kept to a strict maximum while maintaning crystal clear sound. A supersonic sample rate DSP stereo encoder provides MPX generation with fantastic stereo seperation. The easy to use front panel control system and LED metering display afford the user with ease of use and setup while a cool windows application makes it even easier, and more fun. Comprehensive control of every processing parameter is available both from the front panel and by remote (computer) control.